This table summarizes the computing resources available. For detailed information, please click on each resource link. Try to login at http://my.ucla.edu with your UCLA Logon ID. If not successful, then go to http://logon.ucla.edu to try to resolve your problem. If #1 is successful, email olhelp@seas.ucla.edu with the error message and the resource you're trying to access. Printing of 2000 pages for class related materials only (if activated). You can print by logging in with your TA account in any of the SEASnet labs. You must request for a TA account by filling out the class resource activation form. If you wish to take advantage of printing, specify "Printing of 2000 pages" in the "Additional Requests" box on the form. 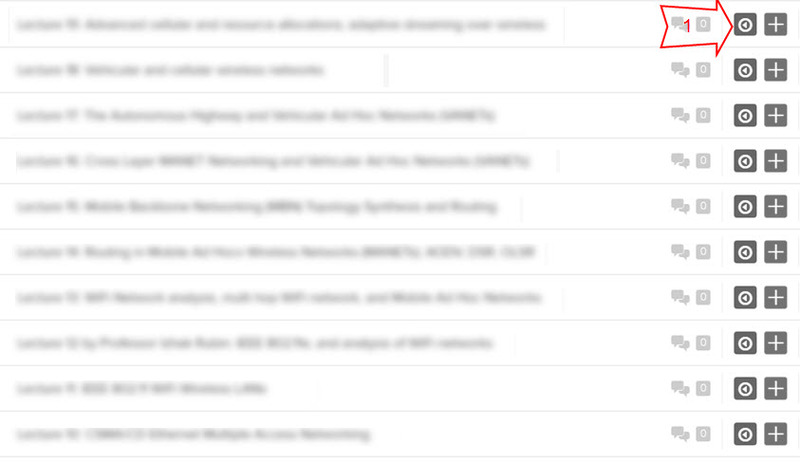 If you need Matlab, Cadence, or any other licensed software (that you've already arranged with SEASnet), specify the software you need in the "Software" box on the form. Your TA account will have access to the same class resources that your students have access to . You must come to the SEASnet Helpdesk at 2684 Boelter Hall to pick up your TA username and password. Your TA account cannot receive email. A digital scanner is available at the SEAShet Helpdesk office, 2684 Boelter Hall (see office hours). The scanner is to be used for instructional purposes only. Echo360 Active Learning Platform is the MSOL's official video capturing system. Echo360 employs AWS to provide top reliability and streaming performance to students anywhere in the world. Echo360 not only provides an industry-leading video system that records and delivers highest quality video, but also provides student engagement tools that promote active learning from anywhere and analytics that can be used to gauge student learning behaviors so instructors can act before it is too late. The MSOL program has staff ready to assist you with the training and usage of Echo360. Please contact oltech@seas.ucla.edu to get started. Additional online user manual is available at help.echo360.com . There is also a video training at https://vimeo.com/album/3455571/video/124051829. Please note that Echo360 is integrated into your class website in CCLE, so that instructors, TAs and students can conveniently and seemlessly access Echo360 while using the CCLE website as the portal to all online technological resources for each class. For any assistance with this integration, contact olhelp@seas.ucla.edu. Check out the studio key from 4732 BH. Be sure to return the key at the end of the quarter. If you need a training, please contact oltech@seas.ucla.edu or 4732 BH. Studio C 4732 BH Zoom for online office hours only. Do not use Zoom for recording presentations. NOTE: For classroom video capturing, contact oltech@seas.ucla.edu. If you need a software installed on the studio laptops, please consult with oltech@seas.ucla.edu. in your possession and return them promptly at the end of each quarter so that they are available on-time to the next instructors/TAs. Login at http://ccle.ucla.edu, select Term under "Class sites", and click on the class you want to visit. Presentations: Gateway to your class video presentations in Echo360. Echo360 is integrated into your class website, so that instructors, TAs and students can conveniently and seemlessly access Echo360 from their class website. Please note that Echo360 contents older than 5 years will be deleted and cannot be restored. A content that is republished to another course offering will have it's birthday reset to the day it was republished. Initially your presentations are NOT released to the students. Your new Echo360 presentations can be released to your students as soon as they are processed. All new presentations are initially unreleased. If you wish all your new presentations to be initially released, please contact oltech@seas.ucla.edu. Your existing Echo360 presentations can be released to your students at any time. All existing presentations are initially unreleased. Note that just before the beginning of each quarter, your IT support will publish all your class existing presentations to the new quarter. If you wish to "un-publish" all of these re-published presentations in the new quarter because you plan to record new lectures, please contact oltech@seas.ucla.edu. Go to your class website. Click on the "Presentations" section (in the left column). Click on the "Echo360 Presentations" link (in the content area). You should arrive at echo360.org at the landing page for the class that lists all your presentations for the class (if not, click DASHBORAD > look for the class and click "ALL CLASSES" button). If any of your presentations are missing, please contact oltech@seas.ucla.edu. Follow the instructions for publishing your content to a course here. Follow the instructions for editing the availability options here. Follow the instructions for making content available or unavailable here. You should arrive at echo360.org at the landing page for the class that lists all your presentations for the class. 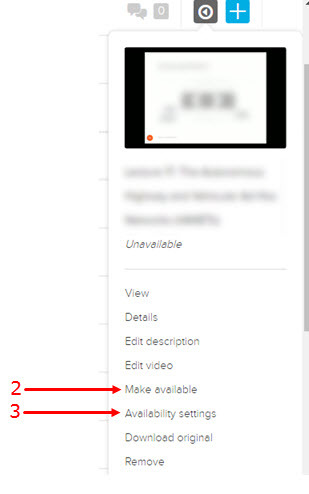 For each lecture in the list, mouse over the lecture and on the far right click on the "down" arrow and then choose "Edit details". Update the box "Class name" to change the lecture title. Set "Sort by" to "Default". Mouse over the lecture you want to reorder and in the far left, drag the triple bar to move the lecture to another location on the list. To group lectures within your Echo360 course, please follow the instructions provided for by Echo360.com here. Tip: We recommend grouping your lectures by week within your course. If you have a bad or unwanted presentation, please email oltech@seas.ucla.edu to delete it. In your email, please include as much detail as possible about the unwanted presentation to minimize any deletion accident. Zoom is used for online office hours. At the beginning of each quarter, you will receive an email with the instruction on how to activate or advertise your Zoom meeting room. Zoom recordings uploaded to CCLE will be retained on the class site in accordance with CCLE's retention policy (usually 3 yrs). Zoom supports up to 100 participants in a meeting room. Instructors and TAs get a "Pro" user account type, which allows them to have unlimited meeting time. Students do not need to have a Zoom account, but if they choose to create one, they will get a "Basic" user account type, which allows them to have up to 40-minute meeting time for each meeting, but unlimited number of meetings. If your class requires a team project, see "Special instruction for classes with team projects" below. Go to http://ccle.ucla.edu and log in with your UCLA Logon ID. In the "Class sites" area, select the correct term, and click on the class you want to visit. Click the "Online Meetings" link in the left column. Click "Zoom Meeting Rooms | Access & Instructions" in the middle area. Login to ccle.ucla.edu and go to the class website. Click "+ Add an activity or resource"
Under ACTIVITIES category, choose "Zoom meeting"
Make sure the new meeting room is listed under the office hour meeting room "Zoom Meeting Rooms | Access & Instructions"
Repeat the above steps for each team. Next you will be asked to email each team the information. To facilitate the email process, you may add Quickmail to your class website. 3. Click on "Team NAME" to join the meeting. 4. When you're asked for the password, enter "xxxxxx". This is the password for your team, so please do not share with non-team members. SEASnet Terminal Server (or Remote Server) is used by TAs and students to access lab software, such as Matlab. MATLAB is not available for your class until you fill out the class resource activation form for your class to specifically request for it. Once the access is given, the TA must provide the students with the instruction on how to use the software. Cadence and other EE software are not available for your class until you fill out the class resource activation form for your class to specifically request for it. Many students have trouble with setting up these software for first use, so please give your students a clear instruction on how use these software. SEASnet has the instruction on to how access the eeapps servers at http://www.seasnet.ucla.edu/eeapps. Your responsibility is to provide the instruction on what to do next after the students have logged in to eeapps. New lab software currently not installed on SEASnet requires one quarter advance notice. Please verify and test software in our environment, including the Terminal Server, prior to assigning any student work that uses the software (use your SEASnet TA account to test). If you have any UCLA Extension students in your class, you must verify that any MSDNAA software required for the class is available on the Terminal Server. The evaluation of instruction program is handled by OID EIP. The results of the course evaluation surveys can be requested from msengrol@seas.ucla.edu. Both the instructors and students will be sent an email to inform them of the evaluation process. For more information on these notices, see Online Evaluation Email Notifications. To view the evaluation forms, see Online Evaluation Form Views. The evaluation surveys open on Thursday of the 9th week and close at 8AM on Saturday of the 10th week.